Two new members — both alumni of Penn Manor High School — have recently joined the Penn Manor board of school directors. 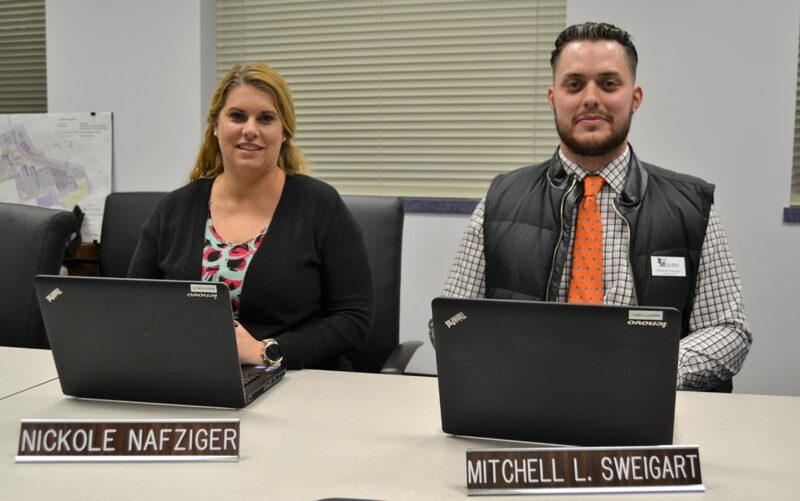 Mitchell Sweigart, a 2014 Penn Manor graduate, was sworn in February 5 to fill the unexpired term of former member Jeff Lyon, who stepped down last month. Sweigart will serve until December 2019. In December, Nickole Nafziger, a 2000 Penn Manor graduate, was sworn in to a four-year term, following her election to the seat formerly held by Johnna Friedman. Nicki will serve until December 2021. Nafziger is president of Agape Care Inc., which provides in-home care services for senior citizens, people with disabilities, and those recovering from injury or illness. She is active in several community organizations. She and her husband, Jeremy, have two children attending Penn Manor schools. Sweigart, who played football at Penn Manor and at Princeton University, will graduate from Princeton in May with an economics degree. He plans to work for BeneFix, a software company in Lancaster, after graduation. He also has interned with the PMF Group financial advisors in Harrisburg. Welcome, Nicki and Mitchell, and thank you for dedicating your time to the all-volunteer board of directors! Nickole Nafziger and Mitchell Sweigart.